Advanced Micro Devices, Inc. and Servers: Whats Going On Here? In 2013, Advanced Micro Devices outlined a strategy to win back share in the server market after losing significant ground to larger rival,Intel . 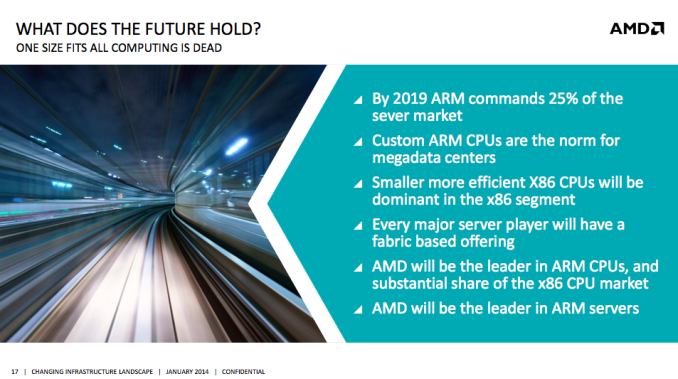 AMD assertedit would be "the leader in ARMservers" and that it would have "substantial share of the X86 CPU market" at some point in the future. As we enter 2015, it is worth looking at AMD&apos;s progress in the server market since those initial announcements. The story on ARM so farAdvanced Micro Devicesannouncedin July that developer kits powered by the Seattle processor were available for purchase. Then, at Hot Chips 2014, AMD did a deeper technical disclosure of the Seattle chip. Since then, though, AMD has been relatively quiet about its dense server efforts. As Charlie Demerjian of SemiAccurate pointed outlast month, two major ARM server chip vendors are now actually selling parts: Caviumand Applied Micro. His article takes a digat AMD, stating that "there would be three if the soap opera that is AMD was anything more than infinite but hollow press releases." At any rate, while Seattle is a real, working chip, it&apos;s not clear whether it is in production yet, and if it is, whether it has many -- if any -- major customers. This will probably become clearer over time. According to this road map, AMD has no plans to update its two-socket and four-socket CPUs in 2015. It does, however, plan to bring two new X86 chips to market: Toronto APU and Toronto CPU. These will apparently integrate two Excavator modules/four Excavator x86 cores, support DDR3/DDR4, have PCIe3 support, and come as single, integrated system-on-chip parts. The main difference between the two chipsis that the APU will feature integrated graphics while the CPU apparently will not. It seems that the "small" AMD x86 cores do not make an appearance here, with AMD opting to address any market requiring many small cores with ARM and any markets requiring more per-core performance with its "big" X86 cores. What does AMD&apos;s competitive positioning look like in 2015?I don&apos;t think this road map is going to be particularly competitive with what Intel should have this year. The aging Warsaw CPUs (32-nanometer Piledriver) will find it difficult to compete with Intel&apos;s Haswell-EP and, potentially, Broadwell-EP chips (although the latter have reportedly been delayed into 2016). For one-socket systems, AMD will likely have to compete with the Xeon E5 v3 chips (Broadwell) during the first half of the year and with the Xeon E3 v5 chips (Skylake) during the second half of the year. Additionally, CPU World reported that Intel&apos;s integrated Xeon D processor, which is a system-on-chip design that should be comparable to the Toronto CPU, will launch in the second quarter of 2015. This should have up to eight Broadwell CPU cores and will be built on Intel&apos;s 14-nanometer FinFET manufacturing technology. In contrast, the Toronto CPU features just four Excavator cores (and per-core Excavator is likely weaker than Broadwell). We&apos;ll have to see what kind of I/O AMD brings to Toronto CPU to properly compare the chips. However, my bet is that the 14-nanometer Xeon D will be more powerful and more efficient than what is likely a 28-nanometer Toronto CPU. AMD probably need to wait until 2016 for a potential improvementAdvanced Micro Devices&apos; competitive positioning in the server chip market looks weak during 2015. However, the story could get better in 2016 when AMD is expected to roll out system-on-chip products based on its new X86 and ARM CPU cores known as Zen and K12, respectively. Bringing new technology to market is no guarantee of success (Intel isn&apos;t sitting idly by), but it will be interesting to see if AMD can improve its competitive positioning. The article Advanced Micro Devices, Inc. and Servers: Whats Going On Here? originally appeared on Fool.com. Ashraf Eassa owns shares of ARM Holdings and Intel. The Motley Fool recommends Intel. The Motley Fool owns shares of Intel. Try any of our Foolish newsletter services free for 30 days. We Fools may not all hold the same opinions, but we all believe that considering a diverse range of insights makes us better investors. The Motley Fool has a disclosure policy.